The problem with computers these days is that developers don't want to create things that work on older computers. "Want to run it, I'm not going to waste my time being creative and efficient. You go get a new machine dadburnit!" is what I imagine them saying. Rinox was the name of my machine that worked well for nearly a decade. When I converted it to be the TVPC it ran fine for a while. I was able to use Flash 9, vlc, and older versions of Firefox. Now though Hulu requires Flash 10.whatever and all I can get through it is a sometimes choppy lowest resolution video format. Might I add that Hulu's low res is now 288 instead of 340. So sad. So anyhow. I've stuck with the same Operating system and general software but the new motherboard, RAM and CPU have made a dramatic difference. Everything I've watched works well at the highest resolution. Video can go right off the board instead of through a separate card and the CPU hasn't gotten close to maxing out. Another nice side effect is that with less things in the case there comes the benefit of less heat, less fans whirring and more peace and quiet during the dramatic silences and such. So how much did it run me? Not much actually. This machine isn't crunching numbers, pushing out high end graphics, or storing big files. All in all it's running some basic functions. Because of that I didn't need a big processor, high end graphics card, lots of memory or a big hard drive. So from that I can get by with components from the lower end of the price spectrum. For all 3 parts (motherboard, RAM and CPU) it was ~$205 + a nice new quiet CPU heat sink was right at $35 (old one didn't fit and the stock one was noisy). Not bad for such a significant such an upgrade! Hmm.. $240 was what I'd pay for 3 months of cable! I just have to show off the heat sink. 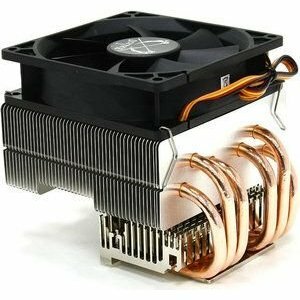 The Samurai ZZ CPU Cooler looks like it belongs on a 1970's muscle car.